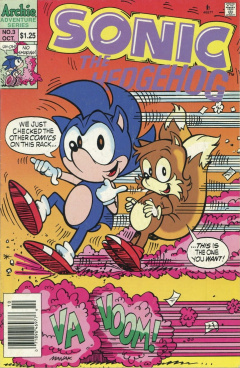 Sonic the Hedgehog 3 is the third issue of the Sonic the Hedgehog comic series. It was released in October 1993. This comic features two stories: The Bomb Bugs Me! and Rabbot Deployment. It also features four featurettes: Tails' Fairy Tales, Double Speak, Paper Trail and Robotnik Rules. 1 The Bomb Bugs Me! Rotor Walrus and Sally Acorn are watching the Great Forest Monitor, which is tracking Sonic. He arrives at their location, faster than what the camera can show on the monitor, sending Rotor into a fit of confusion. Sonic then tells the two that Dr. Robotnik got "The Bomb". He recalls back to when he was in Robotropolis taking out some Swatbots, only to come upon Robotnik talking to Crabmeat about a bomb he got that could kill everybody. Sally thinks over the situation, and the consequences a large bomb could have, being able to destroy the whole forest. Sonic, meanwhile, thinks that Robotnik would use the bomb to end all life on the planet for his own good. Sally is against the idea of bombs on Mobius, which gives Sonic an idea. Back in Robotropolis, Robotnik is alerted to a protest by a Swatbot (whom he thought was referring to Protestants). He looks out the window to see Sally, Rotor and Sonic holding up signs beside a building, protesting against bombs. Robotnik, in his anger, orders a full-out assault on the trio, exiting the building with a whole army of Swatbots. They run at them, only to slam into the wall: they were a projection by Sally from a distance away with a projector. With Robotnik and the Swatbots out of commission, the trio head off to take care of the bomb. Inside Robotnik's base, Sally and Sonic are confronted by Rotor, who is in a Robotnik costume. Sonic looks into the main room, where Crabmeat is chasing around a fly. Sonic tells Rotor to call to him, but he does so in James Cagney's voice. Despite his mistake, he walks into the room with no problem and orders Crabmeat to bring him the bomb, albeit politely. He does so, but questions why he was told in such a polite way. A few moments later, Crabmeat tells Rotor to come into a room, but Sonic is suspicious. Nonetheless, Rotor enters and a fight occurs. He comes out, without his disguise and with the bomb, having dealt with Crabmeat and the others in the room, much to Sally's approval. Suddenly, Robotnik arrives in the room with a broken Caterkiller, proclaiming that Rotor isn't who he appears to be. Sally and Sonic look around in confusion as the Robotnik takes off a mask, revealing that he's Rotor. The other Rotor takes off a mask, revealing that he is actually Robotnik. Each of them take off even more masks, appearing to be the other. Sally and Sonic watch in confusion and annoyance as they continue to take off even more masks. Sonic, now fed up, runs around the two, sending them into a twirl to get rid of all their disguises, revealing the true Robotnik and Rotor. With Robotnik in a daze, they take the bomb and head back to Knothole Village. In Knothole, the bomb is on a table. The trio decide to open it, despite not knowing how dangerous it is. Sonic opens it slowly, revealing a metal cannister. Sally takes it out, revealing that it's a pesticide bomb to get rid of bugs. Back in Robotnik's base, Crabmeat opens a pantry which is full of flying ants. Without his bug bomb, Robotnik responds "I hate that hedgehog!". Sonic, who is resting on a tree, is approached by Tails. He tells Sonic that he read the story The Tortise and the Hare, which Sonic thinks is an "old fossil". Tails tries to convince him that it's a good book, but Sonic won't believe him, thinking that a turtle could never beat a fast animal like a rabbit. Suddenly, a turtle passes by quickly on a rocket-powered skateboard. Sonic changes his mind, a bit. Sonic is on the phone, arguing to the person on the other side of the line. He then zooms off to another phone, retorting. He runs back to the phone and argues again. He runs to the other phone; running so fast that he can argue with himself through the phones. Princess Sally is addressing everybody in Knothole Village in anger, proclaiming that the perpetrators of a certain crime must be punished and that her word is law, putting on a crown and taking out a scepter. She takes Antoine by the top of his shirt and drags him off to begin an investigation. With Sally away, Tails responds in fear in that he has never seen Sally so angry. Sonic, who is sweating, reads the newspaper, which is talking about a debacle of Sally turning blonde, proclaiming that he thought she could take the joke. Rotor, meanwhile, runs off to quickly wash the printer ink that is on his hands. Sonic arrives in Knothole Village, having been summoned by Sally. Rotor has developed some photos, although he got double prints. They look at the photos, which are reconnaissance photos showing Robotnik making progress into the southern sector of Mobius. With no delay, Sonic grabs Rotor and the two run out of Knothole to the surface of the Great Forest. Sonic, with Rotor (complete with helmet, rollerskates and knee/arm pads, tied to Sonic via a rope), enter the Danger Zone. They hide behind a bush, watching as a rabbit picking carrots is grabbed by two Swatbots. They watch as the Swatbots lead the rabbit to a portable roboticizer. Sonic goes to save the rabbit, but is held back by the rope that is still attached to him and Rotor. Meanwhile, the Swatbots have thrown the rabbit into the roboticizer successfully. Sonic, in anger, enters into a horizontal spindash and breaks free of the rope. He then cuts the Swatbots in half and breaks into the inside of the roboticizer. He looks on as he sees the rabbit stuck in the machine, trying to get out, yelling at Sonic to turn it off. He runs over to a switch and turns the machine off, leaving the rabbit woozy. Rotor and Sonic pull the rabbit out, only to realize that she has been partially roboticized from the waist down and her left arm. Sonic recommends taking her to Knothole to recover, but Rotor is worried that Robotnik could track her due to the partial roboticization. Nonetheless, Sonic convinces him to go, as he carries Rotor along, who is carrying the rabbit himself. In Knothole, Sally is sitting on her throne as Sonic and Rotor arrive with the rabbit in a sweat. The rabbit suddenly wakes up and hops out of Rotor's arms, introducing herself as Bunnie. Sally asks what she can do, and, with her robotic arm, she picks up the throne with Sally still on it. Using her legs, she also demonstrates her karate moves, which Sonic barely avoids. Bunnie looks at Sonic, proclaiming that he's cute and fast, asking for his name. Rather than answering, he asks that Sally be put down first. She apologizes, dropping the throne with a bang. To be polite, Bunnie bows down to Sally, proclaiming that she has a dream to be a hairdresser. Sally stands up, now with a bad hairdo, proclaiming that they need one, and asking her to join the Freedom Fighters. Suddenly, Antoine D'Coolette runs in mentioning of a large object. As he mentions it, the ground rumbles as a large Burrobot arrives at the secret entrance to the village. Sonic goes out to take care of it, along with Bunnie who coins her new last name 'Rabbot'. Sonic pops out of the tree stub entrance to Knothole, but is pulled back in by Bunnie just as the Burrobot rolls over it. As it passes by, they pop back up and chase after it, Bunnie being able to keep up with Sonic's super speed. Sonic pulls up beside the Burrobot and creates a large tornado as Bunnie watches on, only to see the bot turn around and hit Sonic with a laser blast from its hand. It goes to run over Sonic, but is turned upside-down by Bunnie and put into the ground. Sonic looks on in surprise, recovering from the blast. He decides to finish off the bot himself by spinning around it, opening and collapsing the ground onto it. The two later return to Knothole, with Bunnie receiving an official welcome as the newest Freedom Fighter. No complaining about my rules! This issue mistakenly refers to Rotor Walrus as Boomer and uses Sally's original pink style. The Great Forest Monitor Sally and Rotor use to check Sonic in The Bomb Bugs Me! lists all the zones in Sonic 2 except for Hill Top, Wing Fortress and Death Egg. On page 22 (page 3 of Rabbot Deployment) in the last frame, Sally is not fully colored. Robotnik's Rules is signed 'I.R. ', which stands for Ivo Robotnik. This page was last edited on 29 October 2018, at 16:35.